The following explanation is designed for a typical administrative procedure,etc.. Since it changes with contents of a consultation, please ask beforehand. Also, if you are interested in the "Legal Adviser Contract" which is a continuous contract, then please ask us. The details of your application are checked in this office by E-mail, "Inquiry (Form)", mail, or telephone. Then, when we undertake the application, we will notify you of that. 3. The time when our works start. Our business for your application will be start from the time of your paying our fee. The time when the purpose of the contract concerned is attained. These are not our fee. For example, please pay the following. (1) The various charges paid to the government. (2) The bank-transfer-charge to our bank account. (3) Transportation expenses. (4) The charge for stamps paid to the government. (5) Translation of a foreign language document etc. And also, please prepare and pay them, before we begin each business. You need pay in advance. When canceling the business for the sake of your convenience, your paid deposit money will be given to our office as the cancellation fee. This office has adopted the appointment system. When you come directly, please be sure to appoint. Our office adopts Best Effort service. Namely, we do not guarantee any result such as permission. This is a standard in Japanese Immigration Lawyers. 4800 Yen per 30 minute in our Asahi Tokyo Law Office. : 160 Yen per 1minutes. 1. Bank transfer(For details, please ask your bank). The name of the branch of the bank to transfer to is "The marketing department of the head office" (honteneigyoubu) in Japanese words. Classification of deposit is "Ordinary Account". (futsuu) in Japanese words. Account number is "Please ask" Please input it in the Number of Half Size. : It seems that there are some input mistakes of the recipient name(the nominee of the bank account). Please check whether the money has been transferred correctly. The bank name to transfer to is "Sumitomo Mitsui Banking Corporation"(in JAPAN). The name of the branch of the bank to transfer to is "Machida branch" . Classification of deposit is "ordinary deposit account". Account number is "Please ask". 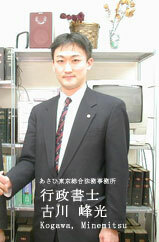 The nominee of the bank account is "Minemitsu Kogawa". : It seems that there are some input mistakes of the recipient name (the nominee of the bank account). Please check whether the money has been transferred correctly. When you consult us, free of charge, in E-mail or "inquiry form" etc., this office does not take the Legal Responsibility about the result caused by our that reply, because that is only "donation." This is specified in the Article 551 of Civil law of Japan. Therefore, this is applied to other offices. This means that FREE (of charge) consultation has its limit in order to give the suitable information to paid clients. So, this Article 551 of Civil Law is applied also to the articles written on this homepage free of charge.